WHY LegalShield is Superior to the Competition! 1.75 million memberships protecting and empowering 4.15 million lives and serving 140,000 businesses. YOU Can Be The Change VIDEO! CLICK the link above to BEGIN the CHANGE! EXIST to ASSIST Others - Pretty simple formula! CLICK the link above to BEGIN HELPING Others! 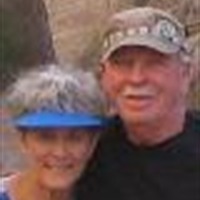 A letter from the LegalShield provider law firm saved this member over $500. The business over-billed the member for services. This is the response quote, sent to the provider law firm, from the business after receiving the attorney letter. - "Why would anyone go to an attorney to avoid paying a credit card fee. Your fee must be somewhere between $250 and $400 an hour, is my guess. I can only assume that you are a friend and are not charging him. To pay an attorney to write a letter when the whole thing could have been avoided by simply writing a check, in my opinion is stupid". WE PROVIDE HELP - YOU GET HELP! See answers to commonly asked legal questions! With Ask LegalShield, you now have access to over 1,200 commonly asked legal questions and answers right in your pocket, and it's FREE for iphone or android smartphones! Just type in your mobile phone number and will sent you the link! Owning your own business can be a very productive and rewarding experience. You will still have to work - but the rules, expectations, and hours do change! It is great being your own boss and achieving financial freedom! LegalShield is available in 50 States and 4 Canadian Provinces! At LegalShield, we’ve been offering pre-paid legal service plans for 45 years protecting 1.6 million members in the USA (50 States) and Canada (4 Provinces). 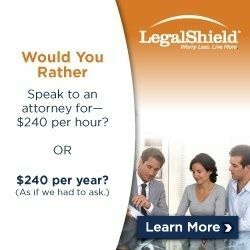 Unexpected legal questions arise every day and with LegalShield on your side, you’ll have access to a quality law firm for as little as $20 a month. From letters written on your behalf to document review, speeding tickets to will preparation, and more, our attorneys are here to provide legal advice — no matter how traumatic or how trivial it may seem. With our legal service and Identity Theft plans you will be protected and empowered. A quality provider law firm will be there to offer your family legal advice and/or assistance on a variety of legal issues that you might face and need to resolve. You have 24/7/365 access to your provider law firm in case of any covered emergency. When deciding to start your own network marketing business there are five (5) key considerations that you need to investigate before you decide to invest your hard earned money. These five (5) items are listed below and should be used when evaluating any company! We have developed a LegalShield business briefing video addressing these five (5) key points. To learn more about the LegalShield business opportunity briefing, click on the link below. CLICK HERE to view the briefing! LegalShield - Who We Are! LegalShield - Your Plan to Financial Freedom! LegalShield - Start Your Own Business Today! LegalShield - Get Paid Daily! LegalShield - Change Starts With You!